Born at Windsor Castle in the presence of her great-grandmother, Queen Victoria, Princess Alice of Battenberg (1885-1969) fell in love with Prince Andrew of Greece and Denmark, son of King George I and Queen Olga of Greece, at the coronation of King Edward VII and married him in 1903. Thereafter, she was often known as Princess Andrew. 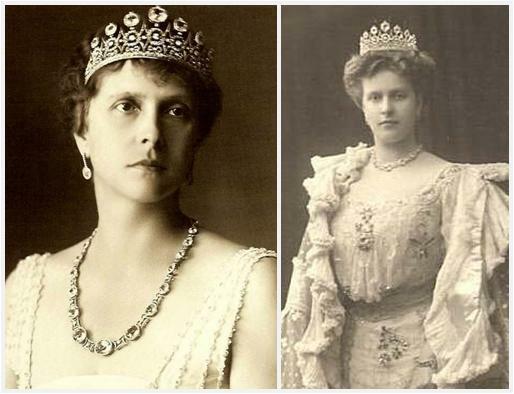 Like most women of her station, she had at least a couple of tiaras at her disposal. This particular tiara from her collection reminds me of the Sayn-Wittgenstein-Berleburg Diamond Spike Tiara, with diamond spiked motifs and circles supporting a row of large single stones. Those large stones are likely not diamonds, and are usually said to have been aquamarines. She may have been born into the most royal setting possible, but Alice's life was not one of privileged ease. She faced an early challenge in her deafness, which did not keep her from learning several languages; later, she was diagnosed with paranoid schizophrenia and endured a period of institutionalization. She married into the highly unstable Greek monarchy, which meant periods of struggle in exile as the monarchy went in and out of favor. She was eventually able to settle back in Athens and lived a humble and charitable life there, including hiding a Jewish family in her home to save them from the concentration camps during World War II. Princess Andrew eventually founded a nursing order of Greek Orthodox nuns. Even with all those notable points, she remains best known as the mother of Prince Philip, the Duke of Edinburgh, who was the youngest of her five children. Her life is truly the stuff of biographies and documentaries and not something we can do justice to in a tiara post. What is clear even from the most condensed version of her life story, though, is that her path led her away from a life of tiaras and jewels. She sold some of those pieces she no longer needed, and gave at least a few away. As a wedding gift for her new daughter-in-law, Princess Elizabeth, the future queen, she gave her diamond Meander Tiara (now worn by the Princess Royal). The tiara we're discussing here also ended up in the collection of the Queen, though not in this format. Princess Andrew gave it to her son in 1947 to break down and create an engagement ring for Princess Elizabeth. 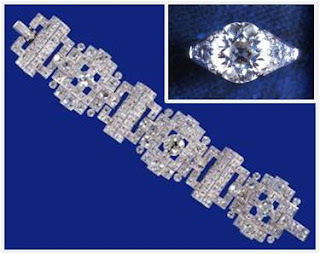 The other diamonds* were used to create Prince Philip's wedding gift for his bride, a wide bracelet. This is another example of a jewel remake that I find superior to the original, and as an added bonus, those diamonds are certainly getting more use today than they would if they were still in their tiara format. Original tiara or ring/bracelet remake, which do you prefer? *Some have speculated that the button portion of Princess Andrew's tiara was worn once by the Countess of Wessex in 2004, but it's important to note that the designs and the length of the two pieces are completely different. Additionally, it's doubtful that there would have been enough remaining diamonds to create the tiara worn by Sophie. You can read more about the piece worn by Sophie, which seems to have been a jeweler loan for the occasion, here from Anna of the Countess of Wessex Blog.